Because there's not a whole lot of activity on the forums lately (apart from the AI War II section), I decided to start a little topic. I recently stumbled upon my old Minecraft folders from a few years back and looked at the modding aspect with renewed interest. Reading through my old notes from back then, it was funny to see how much my mod-related goals changed over time. From "Let's add diamond+1 everything!" to botanics, to "Let's give a use to everything!" and finally to "More late game stuff please." Also, since my favorite modders (except one) have stopped putting out updates (it has been years after all), I decided to go back to the version of the game I enjoyed the most: Beta 1.7.3. If you're not familiar with the beta versions, that's the update just before adventure/RPG content started making its way into the game. 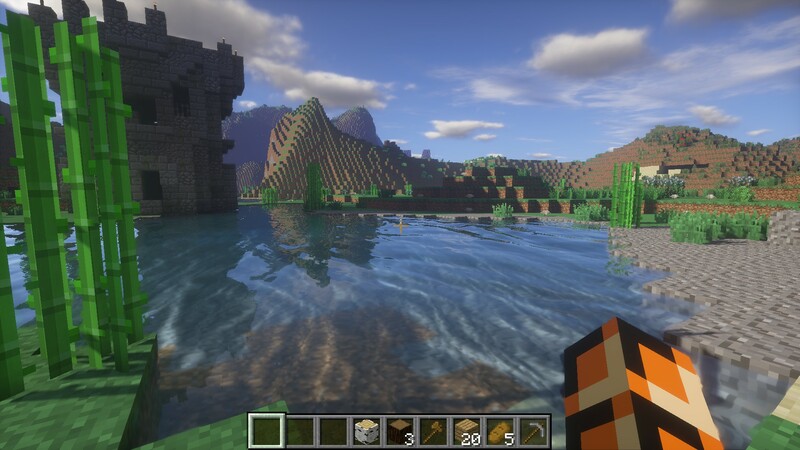 So for those who modded their Minecraft, did you delve into modmaking or preferred to use mods already made? Do you have a favorite version of the game you like to use? Which aspects did you aim to change or expand? I tried to install mods once... or twice on Minecraft. It was such a mess to install that I never wanted to do it again. Modding in Minecraft is awefully handled and even the programs that should make it easier don't help much in that regard. I'm surprised to hear that. It used to be as simple as "Throw mod+requirements in minecraft jar, delete anti-mod folder in jar, done." Anything more complex usually came with a fancy automated installer. Maybe it became more complex after I stopped playing. I've done a few things. Some of them were requests from friends (such as adding a rope ladder that you could drop down into an open void and climb down) others were stuff I did for my own benefit. Artifacts I did as a way of pushing my general programming experience and skills and became crazy popular. After that I revisited some notes I had about what I liked about vanilla and what I liked/disliked about various tech mods and did a group of closely related mods, Reasonable Realism. It's basically an overhaul of the mining mechanics to make searching for ore a directed experience (rather than "dig in a random direction until you find ore"). I'm rather proud of the system. I also did some other things that feel under the broad overview of "lets inject some realism, but keep things reasonable." That is, it shouldn't be realistic for the sake of being realistic, but should add some gameplay value. As well as being within my capabilities as a programmer. But I haven't sat down and played Minecraft in months. It wasn't an "anti-mod" folder so much as a checksum file that would make things go bad. And it's way easier to install mods now. Nah, it's about the same as that. If you're installing single mods it's the usual process, though sometimes it's easier now for some. The big modpacks simply require that you run them... they take care of the rest. Which is probably good because they're usually 110+ mods at once. My old favorite mod was one called Dimensional Doors, which focused around the idea of making these doorways to pocket dimensions that you could do stuff in. You could set up one yourself to build in, or you could jump into others that had who knows what in them. Those areas sort of existed in a void, like the End, except that you couldn't fall to your doom. You were safe in your own set dimension, but if you journeyed into the others it got dangerous. They were usually like dungeons, filled with traps but no normal mobs. Unless you tried to break out of them; there were these Monolith things, which were creepy as heck. Their overall shape blended in with the absolute black background of the void (since you never found them IN the dungeons, they were always outside), and they had no attack, they'd just face you and this freaky red eye would slowly start to open. If one of them got to stare at you for long enough, the screen would do that warping thing that it does for a Nether portal, and you'd be pulled into a sort of Limbo dimension. I'd have a hard time describing that place, but it was probably one of the most unique alt-dimensions I've seen in a mod, due to it's overall atmosphere. Lots of other mods have tried to pull off a really unique atmospheric experience but most of them don't get it right. That second screenshot is a bit processor-explody. 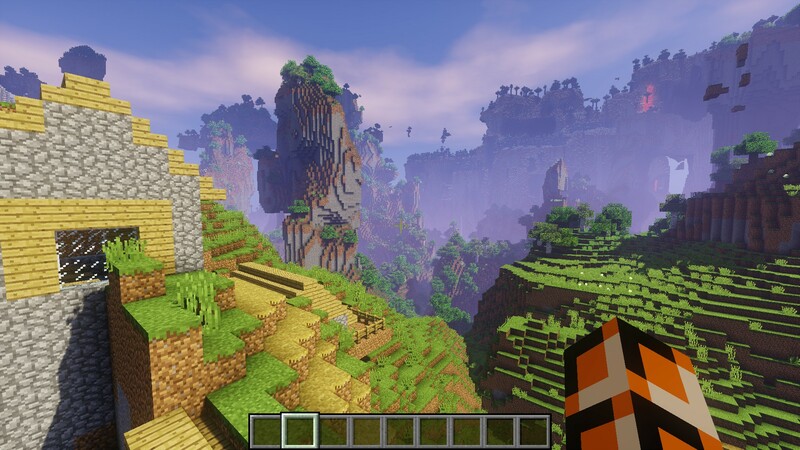 An amplified world with that big shader mod running. My PC, which will typically run anything perfectly, isn't too fond of it. In the first screenshot you can also see that tower there, that's also from a mod that adds "roguelike dungeons". I haven't really explored it yet due to another couple of mods that make the game way more difficult so it's too dangerous to go in currently. Outside of that I'm (very slowly) learning to make stuff of my own. Bloody complicated though. Not exactly something I'm good at. Glitchy weirdness is likely to result, just like basically anything else I do. Yeah, that's already the part that I couldn't get done. I'm a simpleton when it comes to computers. I think I got only one mod ever work and I don't even remember which one it was. And I downloaded a ton of them because a lot of them looked cool. Stuff like "Feed the beast" always interested me. Pretty awesome mods you made there. I especially like the extendable/retractable rope ladder mod. Very nice. Oh, that's an intriguing one. And those Monolith things do sound like the creepiest threat. It's gotten MUCH easier in recent times. You should be able to just download something like FTB... which now takes the form of a full program with lots of mod-packs to choose from, you just choose a pack, hit go, and wait for it to do whatever the heck it does in the background. You can even add extra mods to a pack by simply plopping their zip file (you don't even have to extract them) into the folder that the FTB tells you to put them in. It's pretty great, really. It's sooooooooo much better than the old way (which I hated). I still remember setting up the original Aether mod, probably the first major mod made for the game (looooong while ago, the game was in a pretty early state, and it was bloody difficult to make mods, so few people knew how at the time). That's one of my best memories of the early days of it, really... there was something special about that mod that nothing else has really managed. It was basically the "sky world" that Notch had originally wanted to make for the game at one point (which later became The End). Nobody had seen anything like it. Lots of custom mobs, ores, weapons/items, bosses, dungeons.... it had everything. Other mods have surpassed it in size now by quite a bit, but still, it really was something else. But holy heck was it a pain to set up. There was no FTB or easy Forge use back then... it took ages for me to finally get the thing working. And that was just ONE mod. Later when I started trying to combine multiple mods, it just got more and more loopy as there was always things like ID conflicts to deal with (which were pretty much the bane of modders back then). The only problem with mods now though is learning them. The big FTB packs often go so far as to add 20000 new items/blocks/mobs/whatever (not an exaggeration or a typo). The good thing is they always come with the "Too Many Items" mod that's basically a giant encyclopedia of absolutely everything, but still, figuring out what various things actually DO is still a pain. You usually have to look for the forum page of the particular mod you're interested in, to learn to use whatever unique mechanics or such that it adds to the game. Though, for many that's part of the fun. Indeed not. As he put it, he'd originally intended and expected that it would be a fairly small, niche game that he'd work on for just a few months, sell as much as he can as a sort of part-time work (keeping his other job too), and then he'd move on to the next game. He sure as heck didn't expect to become a freaking billionaire from it. But then, the new concepts and such that were introduced were, to me, almost inevitable in what they'd end up doing to the industry as a whole. Having the sort of extreme freedom that the game offers was a very new thing, and people loved it. And it's just gotten more and more like that as development continues. Heck, with the mods, you can make the game into whatever you personally want it to be. There aren't really any rules as to what you can or cant get the game to do. But even in vanilla there's so much. The game took a lot of people by surprise, too. I still remember trying it for the first time during it's Indev state, when mobs gave you points and skeletons fired purple arrows, and I didn't understand what in the heck was even going on. I remember a Creeper exploded, and of course this means that the surrounding landscape sprayed blocks all over, and I grabbed some of them and wondered what in the heck I was supposed to do with them. Had never seen anything like it. I put it aside for some time and didn't REALLY jump in until later; I came in a few months before chickens were added, back when zombies dropped feathers, because that made sense. That's some impressive stuff you've got there... I imagine it's tough to make things of that level. Or at least I've always thought so. By the way if Dimensional Doors sounds awesome, check out Mystcraft. The thing however is, I'm not interested in Minecraft anymore. At least not at my PC, I still play from time to time the Pocket Edition in my iPhone. Isn't ti nice that you can full PC games now on mobile devices? What a great age of technology we live in. However, when it comes to Open-World/Brickbuilder/Survival games, minecraft simply does not cut it. It was maybe the one that kicked it all but it's also the least appealing now. It's not a bad game but the collection of many other games out there is just better. I guess that's the reason, why people mod this game so much anyway, because they simply want more from it that there is, because other games simply HAVE more. Terraria, Junk Jack, Subnautica, ARK (even if I despise that one). Minecraft simply cuts it anymore, at least not for me. I'm pretty sure for many others it still has its charm. Also, Creepers. I hate these pests and that's probablyone of the main reasons why I avoid this game. Maybe I will try FTB some time. But not anytime soon. I tried that one awhile back... didn't really get into it. My problem with that one was that it tended to make worlds that never really felt new... it'd do things like just scribble wood and nether blocks through the air, or stuff like that. The worlds tended to mostly just look buggy, at least to me. Didn't really feel like an alternate world. Granted, it's been awhile. Possibly it's changed since then. Eh, kinda the opposite for me. I've tried a lot of games of this type, but I haven't found one that equals this. Terraria comes closest (and has the advantage of also being like a Metroidvania game), but it hits it's limits after awhile; when you've beaten the end boss, there's just nothing else to do. And "old" content in your world quickly hits a point of being useless. In Minecraft, something like Iron is ALWAYS useful. But in Terraria, it quickly becomes worthless when you're ready to go to the next tier. I do appreciate the game's huge variety of items and such (and the Diablo-esque nature of them) but very few of them are what I would call "core" items that things tend to revolve around; they're more extraneous than anything. Minecraft seems to have mostly gone the other way; things are added only if they have a distinct purpose (even if that purpose is decoration). Like, the idea of having all sorts of different ores and loads of different swords was suggested a billionty times by the fans, but the devs never did it. By their view, what would the point be? They'd still be the same swords as always, just with different stats and forcing the player to memorize the uses of even more ore types. So instead, they created the enchantment system, which totally did away with the need for "tiers" beyond wood/stone/iron/diamond. I tend to like streamlined development like that, where each element tries to differ a lot rather than just being super similar to old ones. Even mods tend to be like that; there may be 20000 items in an FTB mod, but within each individual mod, the same design philosophy can be there (there are of course plenty of mods that do exactly the opposite, I've always avoided those). I do still really like Terraria overall though, but I've never been fond of it's progression system. It feels repetitive rather than interesting... I'd rather have more varied uses for each ore instead of just using each one to go up a level, essentially. I tend to look at the game very differently from Minecraft though. Junk Jack is pretty great too, but I mostly have that for my iPad (my portable gaming device of choice). My biggest problem with that game is typically the combat... enemies are VERY non-threatening and a bit too simple (Minecraft doesn't have the toughest foes, true, but it's very easy for me to change that). It's still good though; and I was glad to finally see the PC version come (it sure took bloody forever, didn't it?) It tends to do the same "loot overload" thing that Terraria does though. Subnautica I didn't care about (as I understand, that game isn't actually procedural and is missing a lot of the elements I associate with the genre, so I didn't really bother), and ARK, frankly, can go screw itself. That one seriously just doesn't look like much fun outside of multiplayer, which I avoid these days. But also, these games all have very different styles as a whole, so they end up just fulfilling different roles almost, to me. Kinda like the older Mario games VS the older Sonic games; Mario was always my favorite, but Sonic was good too and was also just DIFFERENT. I look at roguelikes the same too: Nothing will ever top Isaac as far as I'm concerned, but there's still others I think are absolutely fantastic. One that you might want to check out is Empyrion, if you haven't heard of it. Space theme, that one, it's on Steam. It's looking to be EXTREMELY expansive though a quite different gameplay focus than others in the genre. I've had it on my follow list for quite awhile (I really need to just pick it up and try it) and I've never seen patch notes as crazy as that, not even from Arcen. Patch notes are typically looooooooooooooooooong and extremely frequent. Reminds me of Dwarf Fortress as that aspect goes except that it doesn't take 10000 years for a new update to come out. And they still consider this game to be in freaking alpha, which just baffles me after all I've seen of it. As for creepers: I don't really get the hate for them (they are to Minecraft what Goombas are to Mario, as I see it) but it's easy to simply turn them off if desired. I, personally, usually just make them more unpleasant. Because of course I do. Yes I'm rambling here but this is one of those games/genres I could talk about for quite a long time. I find these fascinating. I also need to dive into Factorio at some point. Just... the learning curve on that one, bah. It's still like that, but more complex features and interactions aren't in yet. There's been a lot of refactoring to the grammar system and not much work on "more symbols." That was probably at least one of my favorites too, though in my experience you also had to worry about them if you didn't try to break out because there were often holes in the wall. I like how you can get a sword pretty much allowing you to "cut" a doorway into these alternate dimensions anywhere, and to my knowledge you can set it up to be a very efficient method of travelling. If I recall correctly the Monoliths creeped me out at least for a while (mostly the sounds, they made some sounds often and when they saw you they make a sound that if I recall correctly was like a weird sort of scream rising in volume the less time you have left), though the dungeons and traps and stuff were pretty nice. By the way if you get yourself killed in a pocket dimension or go "too far in" aka make too many pocket dimensions within pocket dimensions you could also be sent to Limbo, in the latter case at random with a chance with the first door in I believe, but every door further in increases the chance of being teleported to limbo. The atmosphere there was also kind of creepy, there is a lot of landforms there, in addition to more monoliths that will teleport you elsewhere in limbo, all the blocks were the same and the sky was unusual and if you placed blocks in there eventually they would be changed into the same block, I believe at different speeds depending on the block, and the only way out (except maybe dying) is to go as far down as you can until you see some weird liquid block and jump in it then you would be teleported to a random area in the overworld. I also think I read in some specific circumstances (possibly only by cheating or using some special item from a different mod) you can break through the blocks marking the boundaries of each pocket dimension, and if you go out you will also be teleported to limbo. The creator could probably have set up and interesting sort of story with the limbo and pocket dimensions if he/she wanted, a story behind their existence. I really enjoyed the mod without that though. Oh yeah, I remember that now... there was something different about the sky/atmosphere in Limbo. It was like the void, except... more like a glitchy/fuzzy grey. I seem to recall something about a giant eye. I recall one thing I often liked to do was go into there, and dig up piles of "fabric of reality" blocks (what that place was made of), while of course getting teleported a lot because the place is swarming in monoliths... and then go back into the overworld and build some structure out of that. Usually made my portal rooms out of that because it seemed fitting. And then I'd be tired of Limbo after awhile (and probably stuck in some stupid forest on a mountain after getting out, because it's ALWAYS a stupid forest on a mountain) due to getting teleported like 30 times.